Episode 4: MSP Marketing Release Party! 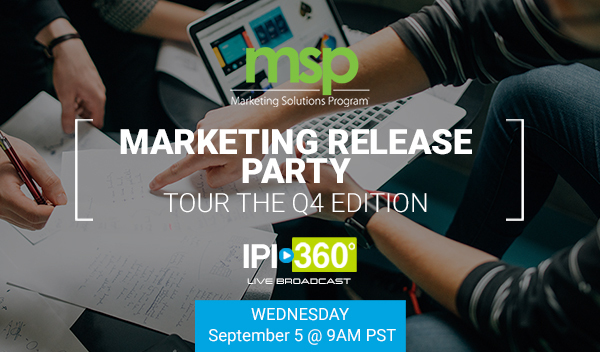 Time to sound the MSP alarm and give you a tour of the Q4 party! To all my MSP users out there, this one’s dedicated to you. Our Director of Marketing, Erin Von Holdt, and her trusty Marketing Coordinator, Natalie Gunn, are ready to give you a personalized step-by-step tour of your MSP Q4 visual index. If you have been wondering, “Where can I find the ‘Save Your Photo Month Campaign’?” or, “What do the new holiday card templates look like?” or even, “How do I download all of these campaigns?” then you NEED to watch this episode. We’re going to show you the WHAT, WHERE and HOW you can access all of your marketing assets to optimize your success in Q4.